The parish has a public cemetery on the northeast side of the village. The webpage author has been unable to find out details on this cemetery. In 1891, the parish was in the new "Grantham South" sub-district of the Grantham Registration District. You can also perform a more selective search for churches in the South Witham area or see them printed on a map. The Knights Templar founded a preceptory here in 1164 on what is now known as Temple Hill. The Knights were disbanded in 1312. Archaeologists still visit the site. The church was originally built in a cruciform layout, but parts were allowed to go to ruin and were removed. The church was restored in 1900. Tim HEATON has a photograph of St. John's Church on Geo-graph, taken in December, 2005. The Anglican parish registers exist from 1686. The Anglican churchyard was closed to further burials in April, 1893. Boyd's marriage index covers the period from 1688 - 1837. The LDS Church's Family History Library has a printout of baptisms from 1813-1851. We have a handful of entries from the Parish register in a text file. Your additions and corrections are welcomed. The Wesleyan Methodists and Congregationalists each built a chapel in the parish. For information and assistance in researching these chapels, see our non-conformist religions page. South Witham is both a village and parish on the River Witham 11 miles south of Grantham, less than a mile off the A1 trunk road to the west. The river flows north at this point, toward neighboring North Witham parish. The parish is bordered by Leicester and Rutland counties on the west and south. The parish covers about 1,770 acres and includes the Forty Acre Wood. "Ermine Street," the old Roman "North Road" to Lincoln, crosses this parish. There used to be train service to Bourne and Spalding in the later half of the 1800s and the early 1900s. That service ceased around 1960. You can visit the village website to familiarize youself with the place. Markery Wood has a car park near the village. The wood is part of the Kesteven Forest. Ask for a calculation of the distance from South Witham to another place. You can see the administrative areas in which South Witham has been placed at times in the past. Select one to see a link to a map of that particular area. In 1842, there are three Pubs in the village; the Angel, The Blue Bell and the Blue Cow. Tim HEATON has a photograph of the Angel Inn on Geo-graph, taken in December, 2005. The Blue Bell Inn was around in the 1800s, but I could not find a photograph of it. Eugene BIRCHALL has a photograph of the Blue Cow Inn on Geo-graph, taken in July, 2002. There was a Fox Inn on the Common in 1882. It may have replaced the Blue Bell. The Fox is not listed in 1900. During World War II, the RAF maintained a storage depot in Morkery Wood for bombs, ammunition and oxygen tanks for aircraft. The unit was designated as RAF South Witham. In 1966, the RAF built a large housing estate here for the servicemen stationed at RAF Cottesmore. The village population trebled in size and the school had to be enlarged as well. On August 2nd, 1973, a Canberra bomber crashed in a field east of "The Fox" pub (the crash site is actually in North Witham). Edward BEAN, corp., Lincs Regt., age 32, died 8 Nov. 1918. Husband of H. Bean of South Witham. Norman W. WING, gunner, 2nd Searchlight Regt. of Royal Artillery, age 21, died 15 Oct. 1943. Son of Robert Henry and Hilda Wing of South Witham. 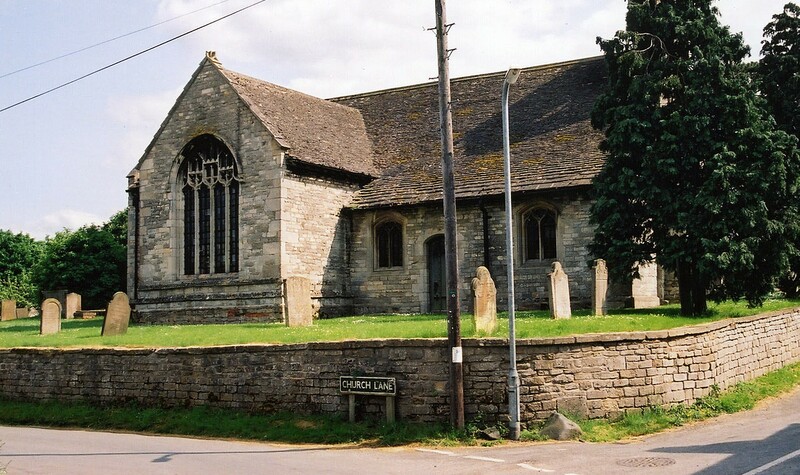 The parish was in the ancient Beltisloe Wapentake in the South Kesteven district and parts of Kesteven. You can contact the Parish Council regarding civic or political matters, but they are NOT staffed to assist with family history searches. The Common Lands were enclosed here in 1796. There was a charity of £30 left by Richard HALFORD. The interest from this was distributed on St. Thomas day to poor parishoners who had been attending church services. The parish established a School Board in January, 1877. A Board School (Public Elementary School) was erected in 1879, funded primarily by Ralph TOLLEMACHE, and enlarged in 1899. The facility is on Water Lane and the school is now known as the South Witham Community Primary School.